The VENT-V fan series is used in general mechanical ventilation installations, where it is necessary to install a fan on the wall. An exemplary application is supply and exhaust ventilation of flats, offices and restaurants. In industry, they are used in cooling systems, local exhaust, or as general ventilation of workshops. 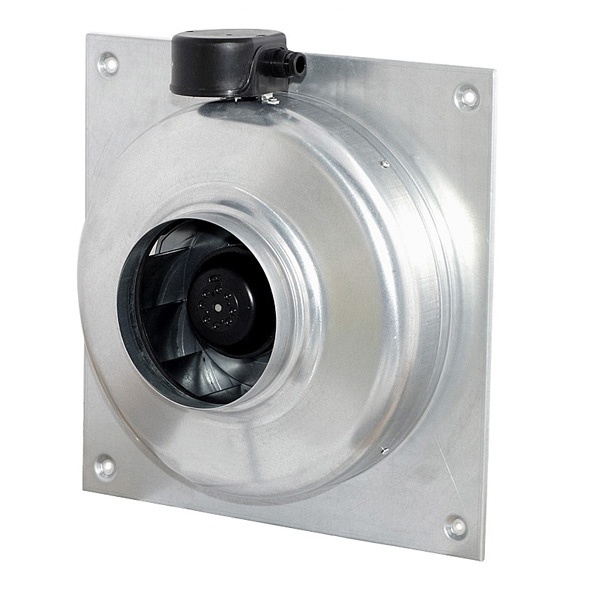 VENT-V radial duct fans are available in seven versions, in nominal diameters: 100, 125, 160, 200, 250, 315. Model 315 is available in two versions, version B with lower characteristics, version L with higher characteristics. Other models are only available in version L.
The fan casings of the VENT-V series are made of galvanized sheet steel. The junction box is located directly on the fan casing. Rotors with backward-angled blades are designed to transport the maximum amount of air at high static pressure and a minimum noise level. In all models of VENT-V fans, single-phase 230V 50 / 60Hz motors are used. Degree of protection IP 44, insulation class B. As standard, motors are equipped with thermal overload protection and maintenance-free ball bearings. All motors are adapted for voltage speed control.